Metal And Ceramic Injection Molding Market size was over USD 2.5 billion in 2017 and will grow at a CAGR over 6% over the projected period. Metal injection molding (MIM), & ceramic injection molding (CIM) are collaboratively called powder injection molding. Powder injection molding combines both material flexibilities based on powder metallurgy and design flexibility based on molding, which helps create metal and ceramic parts. This molding technology is used for manufacturing products of high strength, and complex structures, while providing an improved surface finish. Both metal injection molding and ceramic injection molding additionally impart a sophisticated production capacity than traditional molding processes. This molding process uses a mixture of ceramic or metal powders with polymer binders to produce parts that exhibit properties of plastic. The raw material used for metal injection molding or ceramic injection molding comprises around 60% of ceramic or metal powders while the remaining volume is the binder. The metal and ceramic injection molding market is predicted to increase over the coming years, owing mainly to the growing demand among key end user applications for the size reduction of complex parts that need high-performance materials. The rising demand for small parts is also augmenting the metal and ceramic injection molding demand with various materials, particularly silicone and stainless steel. All these are used to manufacture miniature products in automotive components, aerospace components electronic components, and also healthcare devices that are useful in IV therapy, advanced drug delivery, vascular therapy, and invasive surgeries. Key factors such as growing demand for PIM parts in the healthcare industry is also expected to boost the global market during the forecast timespan. The quality and delivery of metal injection molding processors are guaranteed by several accreditations such as ISO 9002 and QS 9000, thereby increasing the product demand. 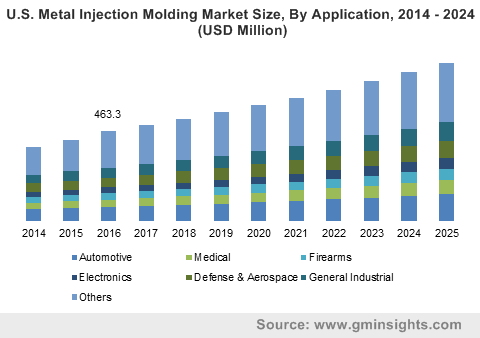 Moreover, increasing demand from firearms in the defense industry, mostly in the U.S., will enhance the growth of the metal and ceramic injection molding market. The global MCIM market is majorly restrained by the limitations regarding the size and weight of the molded parts, coupled with high prices of material used for metal injection molding. Size limitation in metal injection molding processes shows major impact on the growth of global market. Due to the lack of space in MIM furnaces, the most suitable size of metal injection molded products is 10-15 mm. The material required for metal injection molding is a part metal powder, and part binder. Usually, the prices of these materials is high, which in turn increases the prices of metal injection molded products, thereby showing a significant impact on the growth of metal and ceramic injection molding market. The metal injection molding market has been segmented by type into iron & steel, stainless steel, copper, aluminum, and others. Stainless steel for metal injection molding led the global MCIM market, with a share of over 40% in 2017. The demand for stainless steel molded products in automotive, aerospace, and general industrial end-users is significantly increasing due to the high strength of the metal, thereby driving their product demand from the past few years. The demand for these products is expected to rise significantly over the coming years. The ceramic injection molding market has been segmented by type into alumina, zirconia, others which included products such as ferrites, piezoelectric ceramics, etc. Alumina products offer high strength, less machinability, and flexibility compared to other materials, thus preferred more by the end-users compared to other materials. Alumina products in the ceramic injection molding market are predicted to show their significance till the end of the forecast period. Increasing demand for alumina molded products in automotive, electronics, and general industrial end-users is expected to boost the global MCIM market significantly over the forecast period. Metal and ceramic injection market for automotive end-users held the largest share of the global market in 2017, and this will continue to show its dominance till the end of the forecast period. The demand for molded miniature products is increasing the automotive industry, due to their high strength and complexity in their structures. Complex and important components in engines, electronic systems, and locking mechanisms are majorly manufactured by injection molding processes, which is a significant driver to the growth of metal and ceramic injection molding market over the forecast period. Defense & aerospace, medical, and electronics end-users also held significant shares in MCIM market by the end of 2017. The demand for metal and ceramic injection molded products in these end-users is also predicted to drive the global metal and ceramic injection molding market till the end of 2025. Asia Pacific metal and ceramic injection molding market led the global market in terms of both volume and revenue throughout the forecast period, owing to the strong presence of numerous manufacturers which are growing at a significant growth rate. Automotive, aerospace, medical and electronics are some the end-users, where metal and ceramic injection molding perform a key role in manufacturing superior parts. Asia Pacific held a share of over 40% of global market by the end of 2013 and is also predicted to continue its lead over the global market over the coming years. This is majorly due to the increasing industrialization in the developing nations of Asia Pacific like China, India, and Japan majorly. 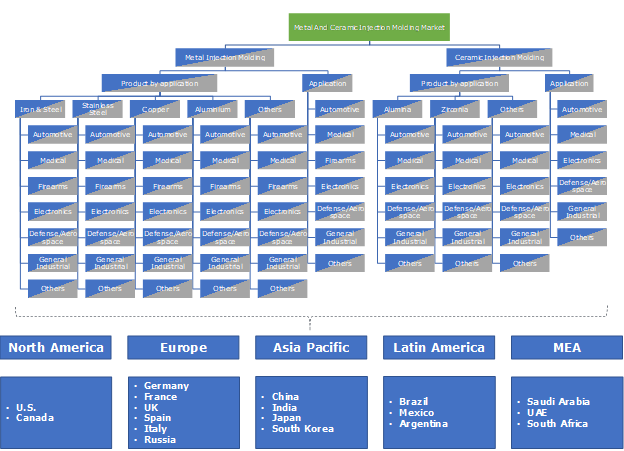 The market growth is further attributed by the rising automotive production in these countries over the forecast timespan. Europe, and North America are also predicted to increase their usage of metal and ceramic injection molding, while Asia Pacific is expected to grow at a higher CAGR in the coming years. Key companies in the global MCIM market are Advanced Materials Technologies Pte. Ltd., Form Technologies Company, CN Innovations Holdings Ltd., Akron Porcelain & Plastics Co., ARC Group Worldwide, Inc., Kinetics Climax Inc, CMG Technologies, PSM Industries, and Nippon Piston Ring Co Ltd. among others. The key players in the market are developing new products to meet the increasing market demand and consumer expectations. Recently, in April 2018, Sweden’s Hoganas AB announced the development of new product area to meet rising market demands within additive manufacturing and metal injection molding. The company also going through some acquisitions to become a leader in the market. For instance, the company acquired of Metasphere Technology and H.C. Starck Surface Technology and Ceramic Powder, which helps them to improve their position in the market. The global metal and ceramic injection molding market has witnessed a huge growth in the past few years. China continued its place as a major shareholder in the global MCIM market and will hold a significant share by the end of 2025. Moreover, increasing molding activities in Japan, and China are expected to boost the demand of metal and ceramic injection molding till the end of the forecast period. Research activities are going on to overcome the high price and size limitation issues. The global MCIM market will also witness a significant demand from the Middle East region, as the automotive production is escalating from the past few years.